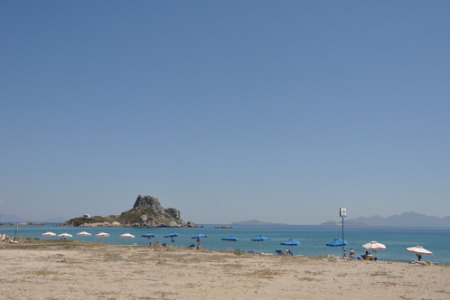 Kefalos holidays fly you to an attractive resort on the south west of Kos which lies in the Aegean Sea. Holidays to Kefalos, a purpose built resort, are popular with families and couples as it is a place where you can relax in the sun, on a beach washed by crystal waters. For the more active visitor, a variety of water sports are offered, including the family favourite, banana boating. Holidays in Kefalos can be taken from April until the end of October. Temperatures rise from twenty to low thirties at the height of the season. If you are seeking to escape the uncertainty of our British summer we have a number of cheap Kefalos holidays that you may find tempting. They are considered good value as our commitment to quality never wavers. Kos is an interesting island with many sightseeing opportunities, including excursions to Turkey, so take advantage of our low cost Kefalos holiday deals and you could soon be on your way. For further details, and to discover our latest Kefalos holiday offers, please use the search facility.